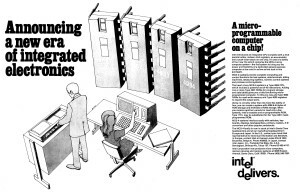 An advertisement in the magazine Electronic News announces the Intel 4004, the first commercially available microprocessor. The 4004 was primarily used in calculators, the first being the Busicom 141-PF. In fact, it was Busicom that actually developed the design of what would become the Intel 4004. Busicom approached Intel to help them finalize the design and manufacture their “calculator engine”. Intel’s engineers reduced the 12 integrated circuit design Busicom had come up with to 4 ICs and delivered the finished product in January 1971. Busicom had exclusive rights to that design until later in that year, when Busicom and Intel renegotiated their contract with Intel lowering their prices to Busicom in exchange for rights to the design of the microprocessor. 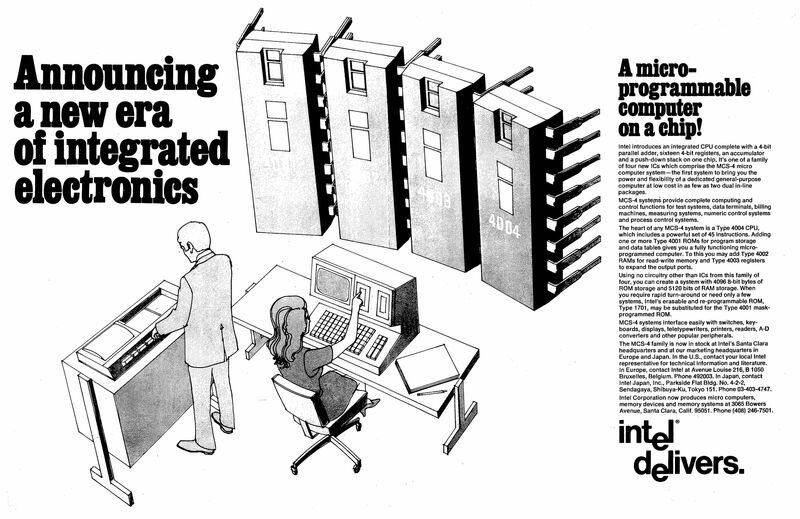 By offering the first general-purpose programmable processor to the general market, Intel spurred the rapid development of electronic devices in the 1970s, culminating in the development of personal computers during that decade. However, Intel wasn’t the clear leader in the microprocessor market until the IBM PC and clones helped catapult Intel to that title in the 1980’s.